It’s a service that allows you to collect social web data and then either use it for business analysis or automate responses; it has an OData endpoint so the obvious tool for doing the analysis is PowerPivot, and I guess it could also be a data source for Data Explorer when that comes along. At the moment it’s very limited in that you can only analyse the results of one of two feeds that aggregate data about either Bill Gates or Windows 8, which is a shame, but it should still be fun to play with. It returns the value 1 – which, strangely, is the value of the original TESTCALC calculated measure before any of the scoped assignments were applied, even though it would seem that the two scoped assignments between them should cover the cells returned by this query. When you try to run the two queries above you get the value 4 returned in both cases. When I first saw this I thought the results returned by two scenarios were inconsistent and that there was something buggy going on in the first one, but Jeffrey told me there is a specific rule in the engine that dictates this behaviour, so it’s how it’s intended to work – as a result, it’s something that needs to be understood and allowed for in any scoped assignments you write. One of the most interesting things I saw last week at the PASS Summit was Data Explorer, the cloud-based data transformation and publishing tool that was demoed in the keynote on day 1. While it was roundly dismissed as ‘yet more Excel’ by the disgruntled DBA faction I thought it showed some potential (you can see a walkthrough of what was shown here) – even if the fact that it was a SQL Azure Labs project suggested it was not destined to be a real product. We still have both the client and the cloud service but we only showed the cloud bits at PASS last week. I would urge you to go and watch the video, because what’s shown is a very substantial, capable tool: an Excel addin for doing self-service ETL. Tellingly the name of the tool in the demo is “PowerImport” – and although Tim suggests in his blog that “some names and concepts have evolved quite a bit since March”, the choice of name speaks volumes. It looks like this could be to SSIS what PowerPivot is to SSAS, and a big selling point for Microsoft’s self-service BI story if it does get released. Why has all the data in my cube disappeared? Here’s an issue that I’ve encountered many, many times over the years on the newsgroup and the SSAS MSDN Forum but which, for some reason, I’ve never blogged about until now. It happens from time to time that when people are developing a cube they find, mysteriously, that all the data has disappeared from it; however, there is data present in the source database and there are no key errors while processing (see here for a recent example). What’s going on? The first statement in the MDX Script of every cube should be the Calculate statement, shown above. 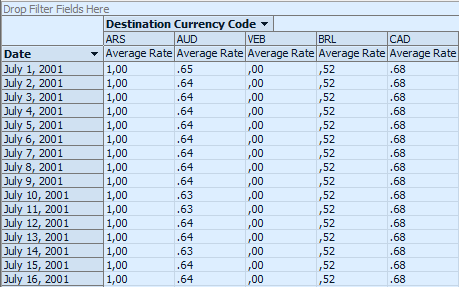 It’s a bit of a hangover from functionality that I remember from beta versions of SSAS 2005 – you could do some interesting things with a Calculate statement back then but the functionality in question got dropped before RTM. It nonetheless still has to be present though, because when SSAS encounters it when the MDX Script is evaluated it triggers the aggregation of data in all the real measures of the cube up from the very lowest level of detail up to the highest. The third and final keynote at the PASS Summit, and this morning I’ve been given a space on the official blogger table at the keynote! Actually this just means I’ve got a table to rest my laptop on and access to a power strip, but it’s an honour nonetheless. There are several things that I saw yesterday that are worth mentioning. Probably the most interesting session was from Cathy Dumas about Tabular: among other things she demoed a DAX Editor plugin for BIDS SQL Server Data Tools that is going to make everyone’s life soooo much easier; it will give us something like an MDX Script editor, intellisense, colour coding and so on. She has blogged about it here and I can’t wait for it to be made available. Also I came across the Data Explorer team site and blog; if you are interested in getting to play with it when it’s ready then you get your email address added to the invite list. He thinks that the arrival of NoSQL is not a paradigm shift, in the way that the move from hierarchical databases to relational databases was. The assertion that SQL is not dead, not surprisingly, goes down well with this audience. He does a comparison of Hive vs Parallel Data Warehouse v.next on the same queries, same data and same hardware, and shows that PDW can outperform Hive by up to 10x. This demonstrates that a parallel database still has advantages over a NoSQL approach as far as performance goes in many cases, although of course each has its own strengths and weaknesses and performance isn’t the only consideration. This was not only an enthralling and educational talk, but it was also great marketing from Microsoft’s point of view. You can announce Hadoop for Windows to a room full of SQL Server types and however many whizzy demos you do, and however much woo-hooing goes on, if we don’t really understand the technology we’ll go back to our day jobs and ignore it. On the other hand, teach us what the technology actually does and you’ll get us interested enough to try it out for ourselves and maybe even use it on a project. Finally, if you’re at the Summit today come and find me at the Birds of a Feather lunch on the SSAS Performance Tuning table, or later on the BI Expert Pod this afternoon. It’s only day 2 of the PASS Summit and I’m already feeling conferenced-out, although that might have something to do with my alcohol consumption over the last few days, the jetlag, and the early starts. I saw a few good sessions yesterday, although for some reason all the BI talks were allotted ridiculously small rooms so I had to stand or sit on the floor for them. Probably the most impressive from my point of view was a talk I saw yesterday afternoon about Power View (Crescent). Now, I’ve seen a lot of Power View demos over the last year or so but it seems to me that over the last few months since CTP3 the product has turned a corner and gone from being something that was kind-of-good-but-I’ll-wait-for-the-next-release to something that is genuinely worth getting excited about. I can’t really put my finger on what has happened – maybe it’s just reached a critical mass in terms of functionality and it doesn’t seem like a typical Microsoft Version 1.0 any more; certainly it was the first time that I’d seen it and thought that I’d be willing to take the pain of installing Sharepoint to use it. Appliances. There’s now a Dell version of PDW, but in general big boxes with flashing lights don’t get me all that excited. More on PDW and its roadmap. The next update (pre SQL2012) will get various enhancements including a distributed cost-based query optimiser and limited support for stored procedures. I suspect this time next year I’ll be watching a demo of Tabular in DirectQuery mode working on the next full version of PDW and we’ll have a great story for ad-hoc BI on truly large data volumes. An announcement !? It seems like BIDS, ie BI Development Studio, is no longer a separate thing but should be thought of as part of SQL Server Data Tools (aka Juneau). Wonder what this means for the BIDS Helper guys? Somehow “BI bits of SQL Server Data Tools Helper” isn’t such a catchy name. SQL Azure. The Azure Management Portal is getting a Metro UI; there’ll be a new max size for a SQL Azure DB of 150GB. So nothing massively exciting here from a BI point of view – clearly all the good stuff was announced yesterday. I’ll be back tomorrow; in the meantime, if you’re at PASS make sure you come to my lightning talk this afternoon because I’m doing some MDX and it would be nice to have some people in the audience who have a clue what I’m talking about! The official name of Project Crescent is going to be called “Power View”. I like this name – it has echoes of PowerPivot and (ahem) QlikView. Microsoft will be offering its own Hadoop distribution on Windows; MS have forged a partnership with HortonWorks to do this. I guess this means the end for Dryad/LINQ to HPC as a product, but it’s a good decision – the market doesn’t want another MS me-too product, it wants Hadoop. There will also be an ODBC driver and addin for Excel for Apache Hive, so you will be able to get data from Hadoop directly into PowerPivot and SSAS Tabular without having to stage it in a relational database. It’ll be available as an on-premises solution and also there’ll be a CTP of an Azure-based solution by the end of the year. This is today’s first big announcement, clearly. I have a few customers with the kind of data volumes that mean they’ll be interested in this, especially now it’s coming in a friendly, MS-packaged format. Denny Lee has more details on all this here. There’s a new thing coming from SQL Azure Labs called Data Explorer that will be available at the end of this year. This is a web-based data integration tool for working with data from a number of sources: I can see SQL Azure, Excel, Access and the usual sources are supported, and it also generates recommendations of data from the Azure Datamarket that you might be interested in. 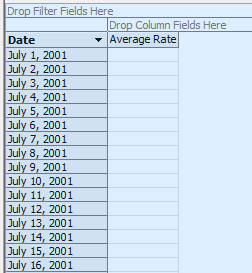 It allows you to mash up data from various different sources then publish the result as an OData feed – very similar to Yahoo Pipes, as far as I can see, but the cool thing is that there’s only one type of (very PowerPivot friendly) end point. Can’t wait to play with this but, however cool it looks, you have to remember that this is coming from SQL Azure Labs so it’s not going to be a real product any time soon. Amir Netz (just promoted to be a Technical Fellow at MS – a very prestigious role, and great for the profile of BI inside the company I think) is now on stage for a Crescent demo. He confirmed that export to PowerPoint will make it into RTM. …and now Amir moves onto mobile BI. He shows Power View on Windows Mobile and… an IPad and an Android phone! Hurray! It seems like, at last, we might have a credible mobile BI strategy from Microsoft. He spends a lot of time demoing on a Windows tablet as well – I wonder why? The audience wants to see the iPad again; maybe the iPad stuff isn’t quite ready yet, but if you remember that Power View is a Silverlight app then you can imagine that this must have involved quite a lot of hard work to do. Overall, some very exciting news. The Hadoop and mobile BI announcements fill some glaring gaps in the MS BI story, and I’m certainly a lot happier than I was this time last year..! The DBA crowd here, though, are a bit grumpy because all the announcements have been BI related – my heart bleeds for them, truly. UPDATE: all references to PowerView changed to “Power View” with a space. That’s the official name.